Al Assad. See his photograph. The Syrian people are living in a state of turmoil due to the consecutive events, the concerns over which have been enhanced by the security situation that was shaken following a stage of stability which lasted throughout the past thirty years. In the meantime, threats of sectarian violence are lurking, and are being generated by the rhetoric of strife in a country characterized by a various religious and ethnic fabric and was considered – until yesterday – as being the only space in which the religious minorities could feel safe in the East, thanks to the secular and nationalistic political regime in place. The nature of the political forces that are activating the protests, as well as their foreign ties. Indeed, there are three parties involved and they are: Abdul Halim Khaddam and his group, Ribal al-Assad, and the Muslim Brotherhood organization, its branches and allies such as the Tahrir Party that is operating from Lebanon. In the meantime, the events are revealing the strength enjoyed on the field by networks and groups evolving under the umbrella of the Muslim Brotherhood organization, its branches and alliances. And thanks to the American adoption of these forces and the support offered to them by Bandar Bin Sultan and Saad al-Hariri, it would be natural to place the action inside Syria in the context of the American-Israeli project to reshape the region and dismantle the resistance system. The introduction of weapons from Lebanon, Jordan and Iraq and the use of these weapons to clash with the security forces, lead to bloodshed and carry out ambushes and crimes targeting army officers and elements, as well as security forces. This situation points to the presence of terrorist groups that are exploiting the demonstrations and the popular gatherings, but also to the existence of a political plan aiming at creating a gap of blood and thick psychological barriers between the Syrian authorities and the people. The budgets ratified by Congress to fund television channels broadcasting from abroad, social networking websites and groups that were trained to use modern communication means, satellite channels, radio stations and Arab newspapers in the Gulf and Lebanon, as well as operations rooms scattered in European and Arab capitals. This reveals orders that were issued from Washington to exploit the suitable internal climate in order to turn the Syrian street against the regime, but also to exploit the Arab developments to transfer the infection on the eve of the set date for the beginning of the pullout from Iraq. It is a new decisive battle over the future of the region. If President Bashar al-Assad wins through the comprehensive renewal of the institutions and the revival of the political and unionist frameworks in the country – while relying on free popular choice – this will enhance and the deepen the roots of the resistance and independence options consecrated by Assad, and based on which he earned the support of the Syrian people during his resistance against the global war launched on the country following the occupation of Iraq. Al-Jazeera’s handling of the Syrian situation constituted a scandal and a final relinquishing of the minimum level of professionalism, as objective reports were replaced with direct political instigation against the Syrian command, and an intentional exaggeration of the events in accordance with the timing of the actions of organized groups involved in a plan to generate political and security turmoil inside of Syria. Last Friday, and since the early hours of the morning, Al-Jazeera started to intensively and repeatedly broadcast – round the clock – a fabricated tape featuring old popular gatherings and demonstrations that were downloaded on some electronic websites weeks ago, while the broadcaster reiterated an instigative rhetoric calling for demonstrations, targeting the political régime of President Al-Assad and downplaying the importance of the decrees to end the state of emergency and organize the right to protest through the repetition of the expression: “This is not enough.” And when the protests and gatherings witnessed in the Syrian cities following the Friday prayers started, the channel began exaggerating its estimation of the size of the protests and the number of dead and wounded whom Al-Jazeera said were targeted by the security forces while completely disregarding the presence of victims in the ranks of the latter forces. The mission of the satellite channel is definitely defined by its owner, i.e. the Prince of Qatar who is clearly involved in a plan to sabotage Syria based on an American assignment. However, what concerns us is the preservation of the minimum level of professionalism which requires separation between the facts which the channel is supposed to convey, and the political positions of its owner that should be conveyed as a public political opinion, far away from the game of exposed political instigation and the promotion of lies. Unfortunately, the channel’s administration, planners and “intellectuals” did not take into account what the following day might reveal, if the situation is exposed and if the outcome turns out to be different from the wishes of the American-Israeli planning rooms. • The Syrian authorities announced they confiscated a large amount of weapons as they were being smuggled from Iraq on a truck driven by an Iraqi across Al-Tanf border crossing. • The Washington Post said in a report that the American Department of State secretly funded the Syrian opposition, as it was revealed by diplomatic cables leaked by the Wikileaks website. • Syrian Foreign Minister Walid al-Muallem announced that what was happening in some Syrian cities required consideration, especially following the speech of Syrian President Bashar al-Assad to the new government and what it included, in terms of the lifting of the state of emergency and the partisan plurality law among other points. 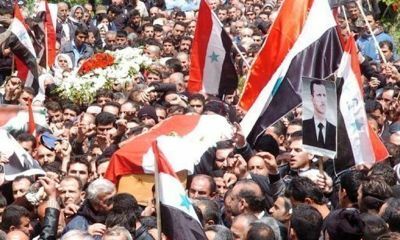 • The Syrian government ratified legislative draft decrees to annul the state of emergency and the state security court and organize the right to stage peaceful demonstrations. • On Saturday, former Lebanese Minister Wi’am Wahhab revealed —during a televised interview— checks signs by Saudi Prince Turki Bin Abdul-Aziz to Lebanese Deputy Jamal al-Jarrah and Okab Sakr, as well as to the son of Abdul Halim Khaddam. This constituted additional proof for what the Syrian authorities had been repeating for a while now, regarding the involvement of regional sides and the Future Movement in the ongoing events in Syria.